Road Trail Run: Skechers Performance Speed Elite Hyper Zebraflage Prototype. Early Look and Details! 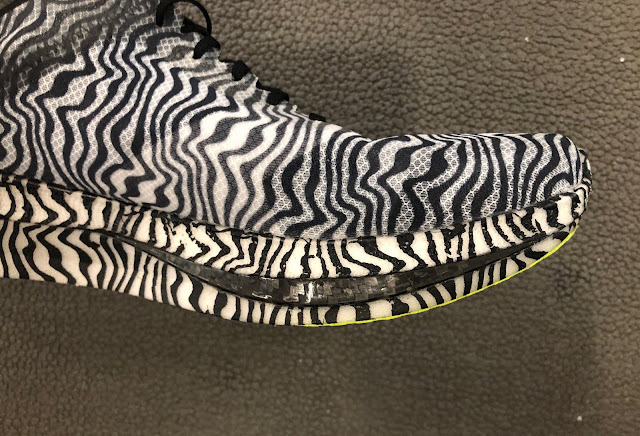 Skechers Performance Speed Elite Hyper Zebraflage Prototype. Early Look and Details! Snow Leopard? No, but close, fast, and from another continent. 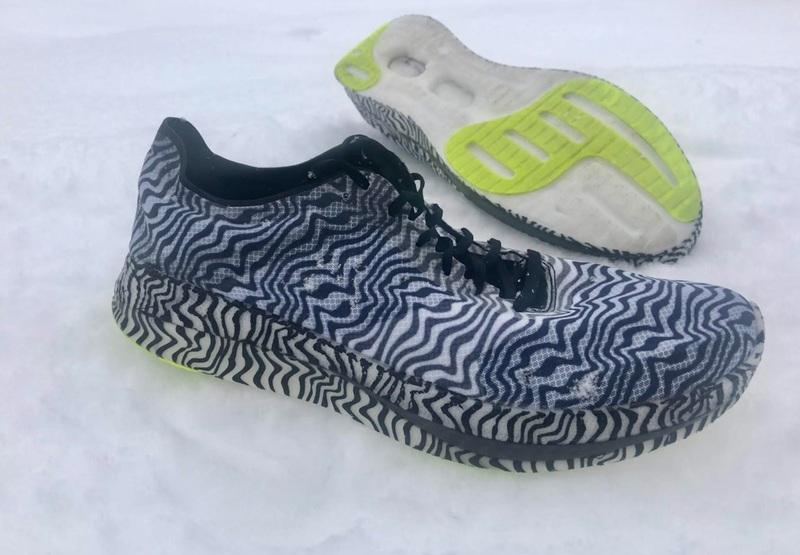 Details here about the Skechers Performance ”Zebraflage” Speed Elite Hyper prototype. It will come to market this fall (in a different color and in limited quantities), and yes it has a carbon fiber H-shaped plate sandwiched between two densities of Hyper Burst midsole. Hyper Burst foam gives it a zingy springy cushion and light weight in my size US M9 proto at 6.2 oz 176 g.
The rigid plate makes for a decisive yet adequately cushioned and stable transition and push off platform, felt at the ball of the foot where the carbon profile is most prominent (see pics), then up and away to an easy, very quick toe off. The combination of Hyper Burst and the carbon fiber plate provides a great stiffness to weight ratio giving the shoe its Fast. The upper is a single layer of very thin, non stretch woven mesh with melted in support overlays and it fits beautifully and comfortably. 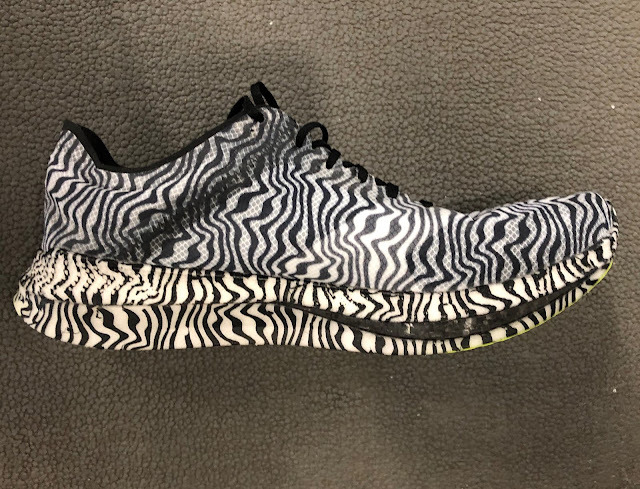 A race shoe for many up to a half, and for some the marathon, even my slower runs in them have been very lively, fun and in no way harsh in feel. Release date, colors, and fine tuning TBD and still underway so please stay tuned. OMG! I want! I'm loving the Hyperburst in the Razor 3 midsole. I wish this would be available for the spring/summer race season!